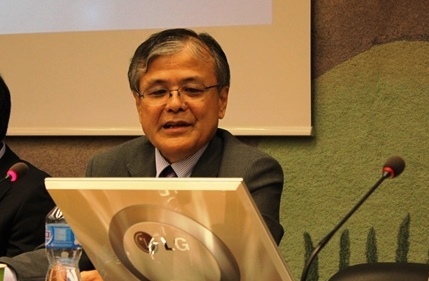 On Monday 21st of September, International Movement Against All Forms of Discrimination and Racism (IMADR), jointly with All Okinawa Council, Shimin Gaikou Centre and Franciscans International held a side event on “Militarization and Human Rights Violations in Okinawa, Japan”. 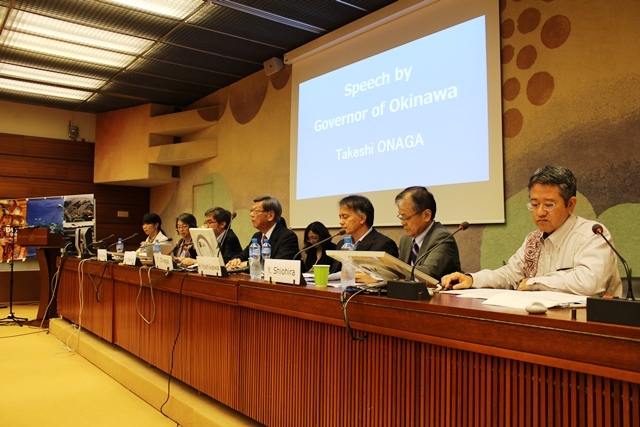 The event was highlighted by the special report of Mr. Onaga Takeshi, Governor of Okinawa, and the comment from Ms. Victoria Tauli-Corpuz, UN Special Rapporteur on the rights of indigenous peoples . Experts from Japan contributed to the discussion including Mr. Hideaki Uemura, President of Shimin Gaikou Centre, Mr. Hideki Yoshikawa, environmental activist, and Mr. Yoshikazu Shiohira, Chief Editor of the Ryukyu Shimpo Newspaper. The first part of the event started with a short video explaining the history of Ryukyu/ Okinawa which tracked from the forced annexation of the Ryukyu Kingdom (a kingdom governing the islands at the time), through the Battle of Okinawa and the U.S. military control of Okinawa (1945-1972), to the current over presentation of the U.S. military bases in the islands. The video captured various issues caused by the large presence of foreign bases such as civilian deaths and injuries, environmental damages, the oppression of freedom of assembly and press. The Governor Onaga delivered his speech following the video screening. He emphasised the key fact that people of Okinawa have never willingly provided own lands for U.S. military bases. Moreover, he repeatedly criticised the Japanese government for ignoring the collective will of people against the construction of a new base in Henoko. He stressed that the collective will is clearly shown from the Prefectural election, but he regretted that the right to self-determination and democracy are not respected. He further addressed the responsibility of the U.S. government for the issue. Furthermore, the attendants were provided an opportunity to hear insights from experts from Japan. 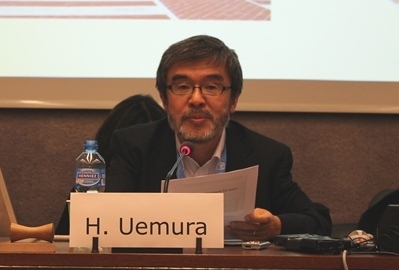 Firstly, Mr. Hideaki Uemura explained the legal grounds of the right to self-determination of Ryukyuan/ Okinawan people. He examined the series of official documents including the Treaty of Amity signed by the U.S. government and the Ryukyu Kingdom in 1854, which established the nature of the Kingdom as an independent state. He criticised the forced annexation of the Kingdom by the Japanese government as a violation of the Vienna Convention on the Law of Treaties. He further shared the text of the 1951 San Francisco Peace Treaty indicating that the Japanese government considered Ryukyu/ Okinawa as a colony rather than a part of its territory. Based on those documents, he concluded that people of Ryukyu/ Okinawa can legitimately claim the right to self-determination. 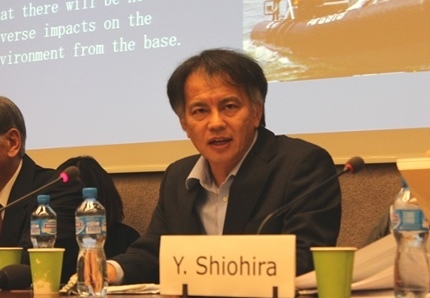 Secondly, Mr. Hideki Yoshikawa addressed environmental damages caused by the U.S. military bases. He reported environmental pollution ranging from the storage of Agent Orange during the Vietnam War to the recent discovery of a massive amount of toxic waste containing dioxin from a former U.S. military base, noise pollution and environmental destruction. He shared concern on the limited access to information regarding environmental impacts caused by the U.S. military bases. He alerted that the construction of a new U.S. military base in Oura Bay, which hosts a rich eco system and endangered dugongs, will violate the right to environment. In conclusion, he introduced the 2008 decision of the U.S. Federal Court. It ruled that the U.S. Department of Defence violated the National Historical Preservation Act by not taking into account the effects of the base on dugongs in the construction plan. 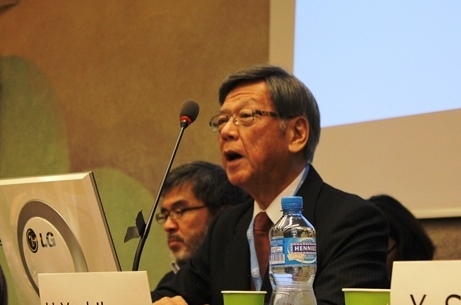 Thirdly, Mr. Yoshikazu Shiohira reported the oppression of free press and freedom of assembly. The freedom of assembly is restricted in Okinawa due to the forced evacuation of peaceful protesters outside the Camp Schwab Gate by the police and the surveillance by the Bureau of Defense Policy. Such measures are taken place on a daily basis, and the Bureau also films protesters which discourage people to engage in protests. The Bureau also installed a heavy iron plate with triangular projections. This plate not only prevents people from protesting in front of the Gate, but also it is life-threatening if one falls. He accused the Japanese government for those oppressive measures. 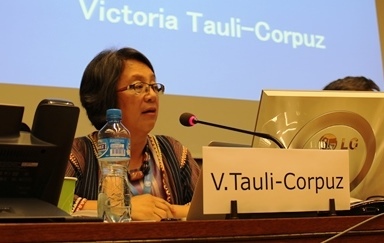 Finally, Special Rapporteur Victoria Tauli-Corpuz provided her comment on the situation. She shared her sympathy to the struggle of Ryukyuan/ Okinawan people, recalling her past involvement with the indigenous movement against U.S. military bases in the Philippines. She noted that human rights violations such as murders, environmental damages and land acquisition also took place in the country due to the presence of U.S. military bases, which resembles the current situation in Okinawa. She repeatedly stressed that self-identification of people of Ryukyu/Okinawa is a key. She told the attendants if people of Ryukyu/Okinawa self-identify themselves as indigenous peoples, rights enshrined in the UN Declaration on the Rights of Indigenous Peoples (UNDRIP) such as the right to self-determination (art. 3), free, prior and informed consent (FPIC, art.19), the right to environment including the protection from hazardous materials (art.29) and the prohibition of military activities in indigenous territories (art.30). She highlighted that those rights are closely related to the issue in Okinawa.